The programme of study marksheets are SIMS version of assessment without levels. Each statement from the national curriculum is available for teachers to assign a grade. Until the autumn 2016 release of SIMS schools have only been able to record their assessment as ’emerging’, ‘developing’, ‘secure’ and ‘mastered’. The autumn 2016 update to SIMS allows flexibility within the programme of study marksheets and schools can now ‘override’ the default grades with their own programme of study grades. Two different types of grades (gradesets) are available. The screen shot above shows the simple gradeset available for each statement. 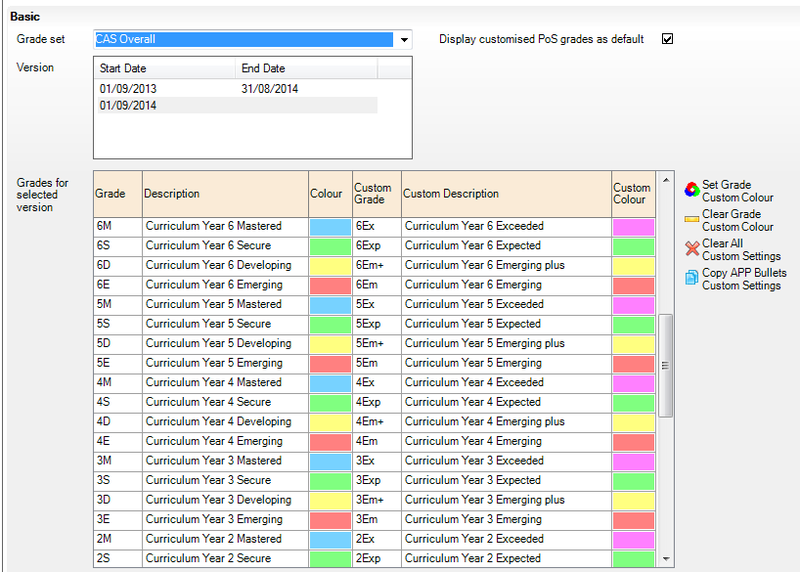 The screen shot below shows the gradeset use for overall grades and linked to the curriculum year. You can use any grades and also enter a description of the grades. Different colours can also be chosen (see the screenshot above). A tick box allows you to use the new PoS grades as a default (so make sure it is ticked before you test the new grades). The process is very simple and requires no specialist knowledge. Historically entered grades will immediately be displayed in the new format with the new colours – there is no need to convert any existing data. The existing PoS reports will also use the new grades straight away (except for the subject/strand report which will use the old grades). The new grades are used by any individual pupil reports you might have set up (e.g. to provide reports to parents). A ‘Copy APP bullets’ button is provided to save time when creating the overall grades. To use it, complete the changes to the CAS App Bullets gradesets (above). Then use the grop down to display the CAS Overall grades. Pressing the ‘copy APP Bullets’ button then ‘flood fills’ all the other year groups with grades in your chosen format. The overall grades now extend up to year 11 to allow the system to be used up to KS4. If one grade is not amended, the original grade is still made available to users (rather than no grade being available, which might be preferable for schools that don’t want to use certain grades). Behind the scenes, the original grades are used so if you display the results in standard marksheet you will still see the original grades displayed. What do you think of this change? Have you used it yet? Let me know in the comments section below. Hi David, thanks for this, I was wondering when this facility would be available. We have extra grades in our grade set so we will just make appropriate choices when we edit the existing Capita grade set. Interesting the SIMs teacher app does not pick up the new grade system and seems to only offer th default grades. That’s a shame. Hopefully the teacher app will be upgraded soon. Has this statement changed at all ‘There is no capacity to add extra grades’ in the newer versions of the system? Yes it has! The current version of SIMS has a new menu option Focus | Assessment | Programme of Study Management | Manage Grade. You can rename the grades to fit your school. But be aware that you still need to fit your grades to the underlying 4 grade structure (E,D,S,M) and your equivalent grade to S-Secure needs to be mapped to Capita’s. Email me if you need more information. Hi Antony, there’s no way to have the overall grades displayed. Users always have to tick the box to display them. We have asked Capita to change this!